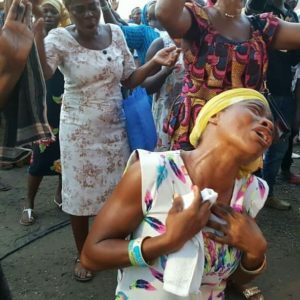 The second edition of Rainbow Radio International’s ‘Agydefour Nhyeamu’ (Gathering of Worshipers) has successfully come off at the Kaneshie Lorry Park in Accra today [Thursday] December 6, 2018. The highly patronised Christian event was organised to afford listeners of the station and the general public an opportunity to worship and praise God for his guidance, love, protection and kindness for the year 2018. It was also a platform offered for prayers to usher Ghanaians into the year 2019. The theme for the 2018 event was ‘’Thank the Lord in Praise and in Worship’’. Awarding winning gospel musicians that performed at the worship event were the evergreen Evangelist Diana Asamoah, energetic Reverend Obaapa Christy, Bismark Takyi, Sammy Baah and Oheyere Boatemaa. The event was not just an ordinary worship and praise but it offered opportunity to a number of patrons who thronged the Kaneshie Lorry Park to accept the Lord as the personal saviour. Some of them who had never attended church promised to attend church because the event gave them a different perspective about God. Traders, drivers and all those who participated in the event were happy and have admonished the station to organize the event on yearly basis. Sponsors for the event were Waakye Queen, The Hunger Project-Ghana, A1 Bread and Bakery, Precat Catering Services, Expressway Homeopathy Clinic, Smart Koko, Organization of International Missionaries and Capital O2 Limited.